The first quarter of 2017 is over but it does not mean that the world of customer marketing has stopped from changing. With the changing dynamics of marketing, businesses have to step up their strategy and make sure that they are reaching their target market effectively- without losing their traction on their existing customers. For novices, customer marketing refers to the set of activities that aims to drive retention, loyalty, advocacy, growth and community participation for current customers. What sets it apart from marketing is that its goal is to build a stronger relationship with current customers of the business. In the past recent years, the importance of customer marketing has hit the roof steadily. 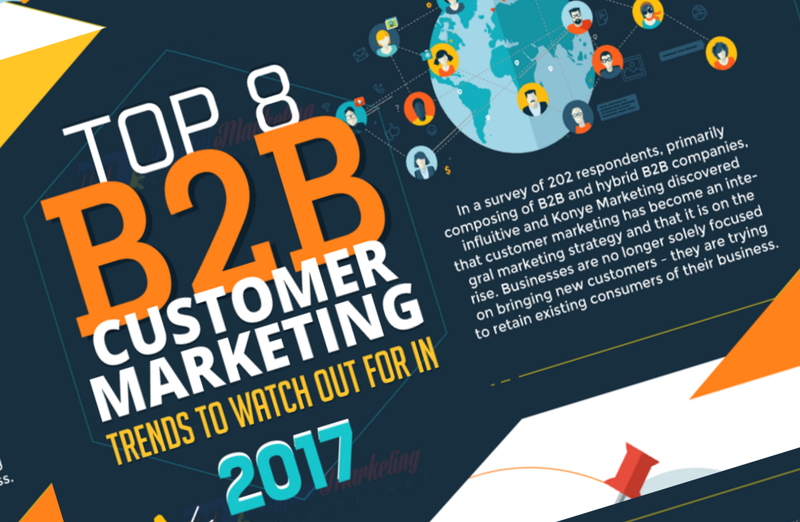 In fact, the report from Influitive and Konye Marketing “The State of Customer Marketing 2017” revealed that 93% of B2B and hybrid B2B companies today are expecting that their customer marketing efforts will take greater importance, and 62% will increase their staff and budgets in this year this 2017. Given that almost all companies are giving so much importance on this area, it is only imperative to know what changes are expected to influence customer marketing this year 2017 and beyond. To know these trends, check out the infographic below from Digital Marketing Philippines.